The name Ash Soan certainly doesn’t need any introduction anymore. Not only will you have heard him play on countless singles and albums from artists all around the world, but every drummer has at one point or another tried to tune down her/his snare drum to find that unique Ash Soan sound. 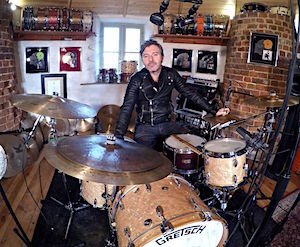 Having played and recorded for the likes of Adele, Robbie Williams, Cher, Will Young, Natasha Bedingfield, James Morrison, Ronan Keating, Seal, Trevor Horn and Billy Idol – just to name a few – Ash has become one of the most in demand drummers in the UK. 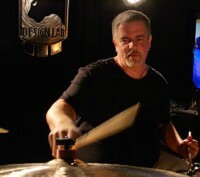 I caught up with Ash after his clinic day at the Ultimate Drum Experience 2016 to chat about his playing, his passion for recording and his recent dive into recording for film. You had lessons from the moment you started playing drums. Do you think that’s important? Yeah, I had lessons pretty much straight away. I do think they’re important and to have a good fundamental / rudimental bases for your playing, you’ve got to start out like that really. How long you study for will depend on you. I know guys who are still having lessons and they’re much better drummers than me. They go to specific guys because they want to learn something from that particular person. So I guess lessons can go on all your life. We’re certainly all constantly learning. Even today I realised a couple of things that were quite cool and I need to get back into the room and carry on working on that. You have a pretty unique technique and touch – we all know the ‘Ash-shoulder’. Did that just develop over the years? Yes, that’s just how I play. Some people say it’s really bad posture and things like that but I just don’t care. 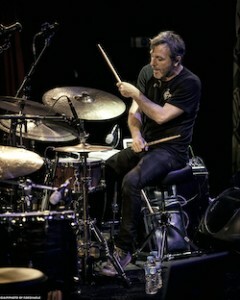 [laughs] I feel very comfortable playing the drums like this and I feel well beyond technique and those things. I need to work on my technique, I think everybody does, but musically what I’m getting across I’m very happy with – the way I’m playing and they way it feels. It might look a little bit weird to some people but whatever. I’d rather look like that than look like everybody else – and sound like everybody else. Some people practise in front of the mirror, what the f***?! Del Amitri was your first big gig. How did you get from there to working in the session scene? The producer of the record that I did with Del Amitri asked me to do another session. That went quite well and I started realising that my sort of playing and my attitude towards playing suited being in the studio and around people in that environment. It just slowly built from there. More and more people started calling me and when one producer is using you, the other producers do know who’s around and it slowly but surely gets more and more. That’s kind of what happened to the point now where I have a few producers who call me to do things. It is only a handful really that regularly have been calling me. Musicians are only as busy as a producer will be and I’m very fortunate that I’ve had a few years where the producers I’ve been working with have been busy. There are some newer things coming through now with my own studio. The way music is being recorded is changing quite a bit now with remote recordings. I think the future will be really interesting. Not just drums, there will be guys that have their own studios who play bass. If you want a particular bass thing you go to a particular guy who has it all set up and that’s how he plays and sounds. I think that’s how it’s gonna go. I think that the remote recording side of things will pick up more and more. It’s almost cheaper to have you record tracks from your own studios than getting you into a studio in town. That’s right, absolutely. If you gonna hire one of the better rooms in town, you’re talking £1200 before you’ve even played. Then you have to pay the engineer, pay the musician, you have time restrictions and all that stuff. Remote recordings aren’t ideal because people aren’t there but it can certainly be convenient for a lot of people, and we as drummers who’re doing it like that can afford to do sessions for a little bit less. I live in Norfolk, it’s a seven hour round-trip for me if I come to town and back. I will certainly take a little bit off my fee to walk across my field to my own studio rather than drive for seven hours. The budgets have changed, whatever people say. There is still as much work I think but there is just less money for it and you’ve just got to circumnavigate that and make it work for you. A remote studio for me definitely seems to work – alongside the studio sessions I do in town. 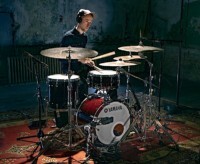 Do you think it’s harder for younger drummers to still get session work and gain experience in that field? Who knows what’s gonna happen, but there are younger musicians coming through. I don’t really know but I’m gonna try to do sessions for as long as I can and I think there will still be opportunities for younger guys too. Also a lot of younger producers out there don’t want to hire me. They go: “I’ve heard Ash Soan, I know what he does, I know what he sounds like, I don’t particularly want it.” which is true. They might want a guy who’s got influences that are a bit more contemporary. So I think there’s definitely an opportunity for younger players to get sessions and work on things. I’m optimistic for young drummers. Would you say you prefer working in the studio or playing live? Recording – absolutely no question. I love that world, I always have. I’ve had my best times really in the studio recording with the creative process and stuff. I do love playing live, it’s great. The thing about playing live though is that you do it and it’s gone. With a recording it’s there forever. You’ve done the ‘The Voice’ for a while now and mentioned that it really got you working on your reading. Yes, that’s right. I’ve been doing it for three years now and I didn’t read very well before and I’m still not an amazing reader now but I’m much, much better. That’s opened up different avenues too. Some film stuff is happening for me now which I’d never thought would ever happen but I’m now considered as I can read well enough to do those kinds of sessions. That’s been amazing. And for me at the age of 46 to have a new chapter in my career to open up now is kind of amazing. I’ve done a couple of interesting movie sessions now and it’s very exciting. I saw a photo of one of those sessions you posted just last week with 14 drummers?! Yeah, that was for a Chinese video game. That was amazing. Having so many drummers in one room playing the same part just sounded absolutely amazing! It was all or my pears in one room: Ralph Salmins, Neal Wilkinson, Ian Thomas, Mel Gaynor, Brian Bennett… it was an incredible experience. It’s a very different kind of working though. I consider myself a song player, that’s my main thing. That sort of music is almost like a classical approach where you’re reading your part and play dynamically you’re playing in a classical way too. There was a conductor that day for instance conducting as all – not that many of us were actually looking at him. We were all just staring at our music trying to get through without making a mistake. I really enjoy it. I quite like the pressure of it as well. I was sandwiched between Ralph and Ian and they’ve done many, many movie reading sessions between them – and I haven’t. You just said you’re a song drummer. Recording songs is quite a creative process, movie soundtracks not at all. Do you still enjoy it? There is a whole new skill set that you’ve got to work on. That’s why I enjoy to have found something that still presses my buttons at my age, that’s kind of cool. I still love playing song sessions but to have something new is fun. Yeah, although funnily enough I have been using a higher snare on a lot of my Instagram things lately. But modern drum sounds… well…. It’s hard no to sound like a wanker but basically everybody sounds the same to me. They all use the same tuning and I can differentiate who’s who. 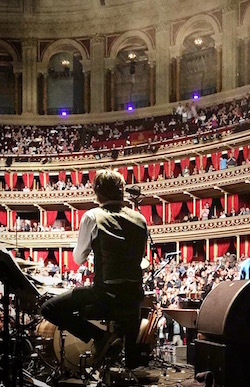 Whereas it wasn’t too long ago where there were individuals in the drumming scene and now there are lots of people who all sound very similar to each other. They’re all sharing the same licks, they’re all inspiring each other to play the same sort of licks faster and faster. It’s more sport than music. That’s just never really been my thing. Touch is what you started with – that’s the thing that makes me go: Wow! Who would be your heroes when it comes to feel and touch? That’s right, lots of people are now doing it but I just copied the older guys with that sort of big phat sound. One of the guys from Vic Firth said that to me: the thing is that there are a lot of young drummers who haven’t heard Gadd but they’ve heard me. They’re now going: “Ash Soan has an amazing snare sound” but it’s frustrating for me because it’s not mine, it’s Steve Gadd’s. 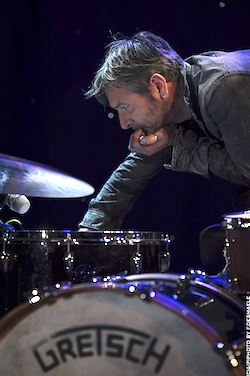 The thing about me and other drummers who’re doing that is that it opens the door for those young drummers. They get curious about where it’s coming from and start looking back so they do eventually find out. On an educational level you’re sharing a lot recently through your app and your Instagram. Yeah, I like sharing my ideas. A lot of people say: “Oh God, you’re giving all your secrets away”, but I don’t see it like that at all. People could have all my gear and they’re never gonna sound like me – and I’m not gonna sound like them – so I really don’t mind. Particular things that I play, I know that some drummers won’t be able to play it like me but I can certainly show people what I’m doing and I like that. You can now with all the social media. When I first started you really couldn’t tap into the players that were around that much. The Instagram thing also has the positive impact that I get messages of support to what I do from many other drummers out there that I like: Stanley Randolph, Mike Johnston from Mike’s Lessons, Thomas Pridgen etc. You tweeted the other day: Don’t get bitter, get better. Oh yeah, I’ve said that quite a few times. What I’ve discovered is that as soon as you’re getting successful, people don’t like it. They like it when you’re not working. It’s just one of those really weird things. And then people have opinions about ‘why is he working’, ‘I don’t understand why they hire him’. I might or might not be talking about myself, it’s up to you to make your mind up, but you know, you just here a couple of things. The reality is I’m working and I’ve always worked and I’ll hopefully (touch wood) continue to work. I just think that people rather than getting bitter that somebody else is working or has a gig, should focus their energy on getting a bit better yourself. Forget about everybody else. You gotta do your thing. I’m sort of past worrying about single stroke rolls and comparing myself to others because I’m very fortunate that I managed to keep working all my life. Good point actually. I think the next proper thing is a gig with the Trevor Horn Band. Last year we did it with Stewart Copeland and Seal so it should be interesting who he’s got as guests this year. 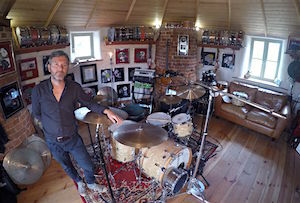 I’ve got a few sessions at my place, working on a couple of albums with different people: tracks for Jessie Ware, Nathan East, Paul Jackson Jr, Kipper and various other remote sessions. I’ve also been working with Take That recently. So yeah, there are some pretty cool things in the pipeline and I just keep chipping away. I’ve been very much enjoying playing at my own studio and getting the playalongs together. Oh yeah, and I’m back with The Voice in September and that’s seemingly almost around the corner. Thanks a lot for your time Ash! All the best for your year.